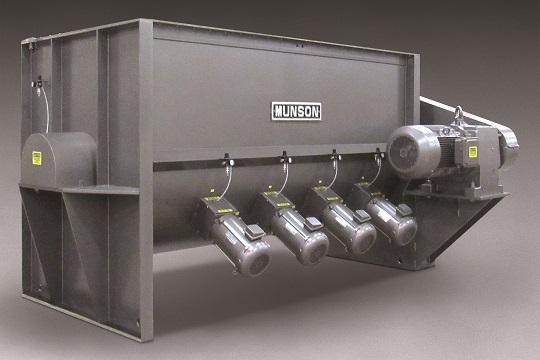 The new Model HD-510-MS paddle blender equipped with four high-speed choppers provides added shear to break lumps and/or disperse dry bulk solids, pastes, slurries, and emulsions containing agglomerates during blending. It handles free- and non-free-flowing materials that are dry, moist, oily, or paste-like in batches up to 200 cu ft.
A high-strength agitator with paddle blades configured for the application pushes material into the path of the choppers. The combined actions rapidly break down lumpy, agglomerated, or otherwise difficult-to-blend materials into discreet particles, which are distributed uniformly throughout the batch. Built for demanding applications, the "HD" heavy duty series machine features a heavy-gauge, carbon steel U-shaped vessel of extreme rigidity, allowing tolerances of 1/16 to 1/8 in. between the outer paddle edges and the trough wall, minimizing the amount of material remaining in the vessel following discharge of blended batches. The paddles project radially from the main shaft, which is flange-mounted for ease of maintenance, and is powered by a 75-hp motor with foot-mounted gear reducer to a chain and sprocket drive. Each high-speed tulip-style chopper features air purge seals for long life and is driven by a 7.5-hp motor.